If you have not received our automated responses to your repeated registration attempts, they are almost surely being intercepted by a spam filter. The first step should be to check your spam folders. If there’s nothing there, and you can’t find another cause, try again, first whitelisting moderncolorworkflow@ledet.com, which is the source of the response messages. If still no good, try using a different e-mail address that will not be subject to a corporate firewall, and if you still are having trouble, get support from your ISP before contacting us. We regret that we cannot accommodate anyone requiring us to register ourselves as a correspondent or to execute any kind of agreement as condition of sending e-mail. NOTE September 13 2014. We have learned that for reasons known only to themselves, Comcast has apparently blocked some of our responses as spam. We are working on this problem. If you are a Comcast customer and are having this problem, contact us giving us your purchase data and we will attempt to assist. A small number of users have reported difficulty getting in to our Private Resources pages notwithstanding having received an e-mail with an access link. All these problems have so far been found to be at the user’s end. We would like to help our readers, but we are not in a position to offer support on general computing matters. So before contacting us, please go over the following, and fill out the information sheet at the bottom. *Certain older browsers are not supported. Internet Explorer 7 and earlier will not work, and there are probably others. *There are several other browser settings that could conceivably interfere with function, so the first troubleshooting move should be to try a different browser and then, a different computer. If you’ve done all these things and still no go, we’ll try to help, provided that you are actually a buyer of Modern Photoshop Color Workflow. Although we don’t put a lot of security on these resources, they are intended only for those who have the book. It’s not reasonable to ask us for support if you don’t. Have you verified that cookies are allowed? Are you linking directly out of the e-mail sent to you, or have you copied the link elsewhere? What other OS/Browser combinations have you tried? Have you tried re-registering for site access? If so, how many times? I cannot get the Adobe Extension Manager CS5 to work in Windows 7. I have tried the file which you provided in both it’s zipped and unzipped forms. It keeps telling me that I do not have necessary administrative privileges. I turned on full administrative privileges, so that this should not be a problem. But the software still claims I do not have sufficient administrative privileges. I keep going around the same loop over and over again with the Adobe Extension Manager coming up, but refusing to load extensions. I am using Photoshop CS5. I have been doing this type of thing for the past 30 years, with numerous programs, including many Adobe programs. So, it is not because I am ignorant of the software or operating systems constraints (I don’t think so, anyway). Am thinking of giving up on it and just running the actions, or waiting until I install Photoshop CS6 and try it again. That could be months from now. I bought the book on or about November 6, on Amazon.com, received it and started reading it on November 8, and just finished it this morning at 4 a.m, on November 20. I have read every book which Dan has listed on Amazon and have thoroughly enjoyed all of them. I am also a member of NAPP (National Association of Photoshop Professionals) for years and have been watching Dan’s training videos, over and over again, on there, since he first posted them. I think the world of him and his work. Which only adds to my frustration. I would really like to see this program up and running but am thoroughly exasperated at this point in time. First of all, thanks for the kind words. I think you’ll find the panel worth the wait–once we can get it up and running for you. In that respect you have some choices. We have recently verified one case and heard of another with our panel, and also know of another extension developer who ran into a similar, where Adobe Extension Manager mistakenly believes that the user is running a much earlier version of Photoshop. When that happens, our installer shuts down and delivers an error message saying that you have to have CS5, CS6, or CC. The problem can be solved by uninstalling and reinstalling Photoshop. As I understand your post, this is not the error that you are getting, it sounds like you are getting a lack-of-privileges type of message. If that’s correct, it’s because Adobe or Microsoft or both believe that you are not authorized to load extensions into Photoshop, ours or anybody else’s. I would certainly tell you how to fix this if I knew, but I don’t, and we can’t start getting involved in troubleshooting that isn’t specific to our panel. If you could load other extensions into Photoshop through AEM, and only ours was the problem, that would be a different kettle of fish. However, we’ve been working on a manual installation package that bypasses AEM, for the benefit of anyone who can’t use the installer for whatever reason. It requires that three folders be placed in various places. We should be ready in a few days and when it is I’ll send you a link so you can be one of the first guinea pigs to make sure that it works. 1) If I’m right that you can’t load extensions at all, you may want to go to adobeforums.com and get help there, as you may wish to be able to have that capability in the future. 2) You can just try uninstalling and reinstalling Photoshop. 3) You can download the actions and documentation and use them without the panel itself. 4) You can wait for the manual installer, which we hope and expect will solve everything. Vincente, further to the above, the link to the manual installation is now ready and I’ve sent it to you offline. Watch for it in case it heads for your spam folder! I received the book 3 days ago. On the back page below the bar code there is X OOO6WCNX. Please note that my email address, used at Amazon(esman@comcast.net) is no longer active. The rest of the registration information is correct. I use a Mac system with the latest software version. I would like to get access to the resources pertaining to this book. Emmanuel, I am not sure what you are saying. To get access to the materials, you must go to http://www.moderncolorworkflow.com/free-resources. If you have previously registered with a different e-mail address, as I understand it you have to register again, as if you were a new user. You should then receive an automated response with your new access code. If there still is a problem, then return to the troubleshooting page, answer all the questions, and send it to us. I am having the issue of AEM thinking that I am not using the appropriate version of Photoshop. i am running CS5.1 (v12.1), but the installation process is telling me I don’t have the right version. It is a corporate installation on my work laptop, so I can’t uninstall/install it. Can you please also send me the manual instructions? Looking forward to learning your new tools. I have sent you the instructions offline. Check your spam folder if you haven’t received it. Thanks for the assistance. The manual installation worked perfectly. I bought Modern Photoshop Color Workflow on Amazon and received it a few days ago. I downloaded the PPW panel for Mac per your instructions. The panel works fine, but the documentations does not work, and the help panel says “permission denied.” I use Photoshop CC and the extension manager is correct in that it is for the CC version. What now? Love the book and the videos. There is an easy way and a hard way of approaching this. where you can download the documentation separately. In principle you shouldn’t have to do that, but it’s the same documentation one way or another, just a batch of PDFs, you don’t need to panel to open and read them. and supply the needed information, especially the full text of the error messages you are receiving. It’s possible a manual reinstallation may solve the problem. If not, it sounds like the issue is one of local permissions, which we may not be able to assist with. But if all you are need is the documentation, I’d recommend just downloading it separately. Don, our system logged two responses to you on 6 February. Josh Pettett will be contacting both of you to see what can be done; meanwhile please double-check any spam filter that may have prevented you from seeing our replies. I have been unable to receive the resources link, though trying many times. It is just not showing up in any email accounts. I have not received the email. I have tried 2 computers and reregistered under 3 email addresses. Yes under 3 different email addresses and also on a different computer. Josh Pettett has messaged you offline with a solution. Please watch for it so that it doesn’t wind up in a spam folder. I just attempted to upgrade the panel from 3.0 to 3.3 and it failed. I am now seeing a screen message within Adobe Extension Manager CS6 telling me “Rolling Back”. This has been going on for about 15 minutes now. I was running the 3.0 panel on CS6/Win 7 64 bit with no problems. I’m hesitant to interrupt the “Rolling Back” process so I will let it run but am afraid my machine is just hung up and the “Rolling Back” message will have to be interrupted. I have never heard of such an error message. You may wish to try uninstalling the old version and then reinstalling from scratch. If that doesn’t appeal, to go further, we need a step-by-step rundown of everything you did during the installation process, with the full text of any messages. I assume, for example, that you got an AEM message asking whether you wanted to update. *The version of Adobe Extension Manager that opened when you attempted to install. *Whether your version of Photoshop is correctly listed in the Products panel of AEM. *If you are using Windows, any version, whether you have attempted to open AEM as administrator (as described above) prior to attempting to install the panel. *The full name (including suffix) of the downloaded file that you are attempting to install from. *The version of Photoshop that you are attempting to install into. *If Photoshop CC, whether it is a trial version or whether you have subscribed. Sorry for the late reply – I’ve been out of town for the past few days. I have a sneaking suspicion that your comment about most of the problems stemming from operator error applies to my situation too. After I interrrupted the “Rolling Back” message from within AEM, I found that I indeed had PPW 3.3 installed just fine. I’m totally fine leaving well enough alone. I’m not sure what caused the “failure to install” message but if it helps: I did not initiate the install from within AEM; instead I double clicked on the download. Another possibility is that I perhaps already had 3.3 installed so AEM hiccupped because of that???? Anyway, no need for further action. I am a instructor at a community college and use your book for my Advanced Photoshop course. Can I get a Instructor copy of this book? If the college would like to place a bulk order for ten or more students’ books we would be happy to include an extra copy for you. Alternatively if you can show that more than ten books were purchased through other sources and send us a copy of your curriculum, we’d send off an instructor copy. Keep us posted with your progress, we are interested in knowing how the book is being used. I received your book today read the intro. Registered, Stopped counting after 3, Never received a link. I have windows7, IE 11, ps2014cc, downloaded the pdf,s and actions, didn,t do anything with them yet. No access to any of the video,s to the chapters. My purchase info follows. Where would I sent the hard copy if need be? The response is automated, so it must be being intercepted, presumably by a spam filter or a corporate firewall. So first, check your spam folders. If no luck, try signing up again from a different account. If there is still no luck please get back to us. I’m another non-recipient of the link email despite many registrations with 3 email addresses on 2 different computers. Purchase: 3/23/2013, Amazon, Stephen Oliver. Comcast acknowledges the possibility that ledet.com could be blocked as a potential spammer but apparently can’t tell without a please-unblock form (http://postmaster.comcast.net/block-removal-request.html), which requires IP addresses I don’t have. I’m using Win 7 and IE 11 and all relevant settings are correct; I also checked my account via webmail. Contact: Steve Oliver, oliversteve@comcast.net 9/10/14. Ledet has confirmed that Comcast has blocked certain replies, for reasons known only to themselves. The two parties are in contact, and meanwhile you were sent a message from a Ledet representative, on which I was copied in, so make sure you have received it. 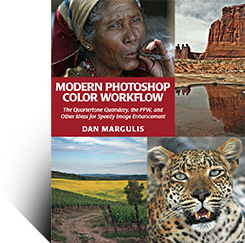 I would like to take the Modern Photoshop Color Workflow intensive course in the fall, but have quite a bit of ground to cover before then. I was hoping you could suggest course(s) focused only modestly if at all on image manipulation using photoshop’s many remarkable tools, concentrating instead on a rigorous grounding in the fundamentals (the material in the “Photoshop Professional”). I am looking for courses like your Color Workflow course that are carefully structured, content dense and very challenging. Any course/instructor recommendations would be most appreciated. If you’re thinking of taking the four-day class in August, you don’t need a special class in advance, you just need to try to practice with your understanding of the workflow, so that you don’t waste class time fumbling around for some commonly-used command. The class uses few Photoshop commands, so its unlikely you’re going to get into trouble that way. So I think my advice would be just to practice with the books, and come into the class well rested. It is physically as well as mentally demanding.